The 32Red Tolworth Novices’ Hurdle headlines ITV’s coverage of Saturday’s action, and while armchair fans might have to become acquainted with a new number as the drama will unfold for the first time on ITV4, the season's familiar faces promise to take centre stage again. For those not in the know, ITV4 – the main channel of the sport's new home – can be found on 120 on Sky, 118 on Virgin Media and 24 on Freeview, and Saturday afternoon is well worth a watch, as in the morning is the first magazine programme, The Opening Show. Rings a bell that name, can't think why. The Tolworth, a £45,000 Grade 1 landed last year by subsequent Neptune Investment Management Novices' Hurdle winner Yorkhill, has attracted a field of six and, whisper it quietly, a star could be born. 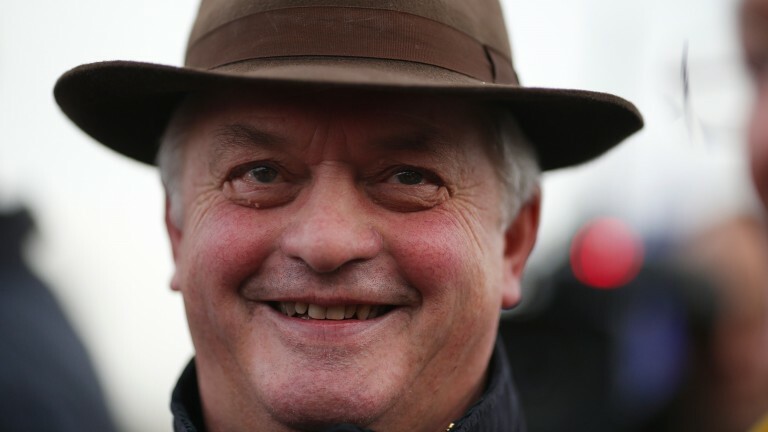 It takes something special for a horse to muscle in on Cue Card, Thistlecrack and Native River in the well-regarded stakes at Colin Tizzard's Dorset barn, but Finian's Oscar could just be something special. An Irish point-to-point winner, he was snapped up by Tizzard and bloodstock agent Tom Malone for Ann and Alan Potts for the not-so-inconsiderable sum of £250,000 in November. Before his debut at Hereford last month there was talk the wraps were due to come off a Tizzard monster and the five-year-old did not disappoint, waltzing home by seven lengths. That prompted jockey Tom O'Brien to say Finian's Oscar could indeed be "something special". But on Saturday he will have to match hype with substance and is not even certain to start favourite, with Ascot Grade 2 scorer Capitaine representing Paul Nicholls, who has won four Tolworths. Whereas the theme of the season has been quality for Tizzard and quantity for Nicholls, the latter's contender is well worthy of his place in the line-up. Excuse his debut and penultimate run, when he may have been given too much to do at Haydock, and he has not done a heap wrong. Capitaine is not the only horse who could trouble Finian's Oscar. Harry Fry has a deserved reputation as one of racing's most astute operators and it speaks volumes that he pitches Bangor novice hurdle winner Chalonnial straight into the Grade 1 deep end, a move not on page one of the trainer's handbook. Charlemar, the horse bought to replace ill-fated Manifesto Novices' Chase winner Arzal at Harry Whittington's stable, must also be respected, as should Celestial Path, third in the Racing Post Trophy in 2014 when trained by Sir Mark Prescott but now with David Pipe. It is an interesting play by the shrewd Pipe, who could be in store for a big day with Dynaste among the leading contenders for the 32Red Veterans' Handicap Chase on Sandown's card. If the Tolworth offers a glimpse of the future, the veterans' race –worth £100,000 – provides a chance to celebrate some golden oldies. With money like this up for grabs it is fair to assume this contest has been circled in a few trainers' calendars, and Dynaste, with two warm-up runs already this term, looks to have the hallmarks of a classic Pipe plan. "If he dropped to a mark of 150 or below over fences he'd be eligible for veterans' chases and that might be an option for him," Pipe said in a Racing Post stable tour in October – so don't say you weren't told. With 19 runners this year, following 15 in the inaugural event 12 months ago, this final is a worthy initiative. Two other races from Sandown will be screened on ITV4 and the near-extinct red silks of owner Jared Sullivan, whose horses run under the Potensis Bloodstock banner, make an appearance in the closing handicap hurdle courtesy of the Nicky Henderson-trained dark horse Discours D'Un Roi. Like many of Sullivan's stock, he had an entry in a Goffs dispersal sale in August but was withdrawn, so presumably he has shown something to make him worthy of being retained. Rishi Persad is on Wincanton duty for ITV on a day that can sometimes have a low-key tone after the Christmas delights. It is not helped by coming at a time when trainers like to give horses mid-season breaks and inoculation jabs. That said, it will not feel like that if Finian's Oscar bolts up. And if you're that impressed you can watch it all again an hour later on ITV4+1. For everyone who can, tune in!